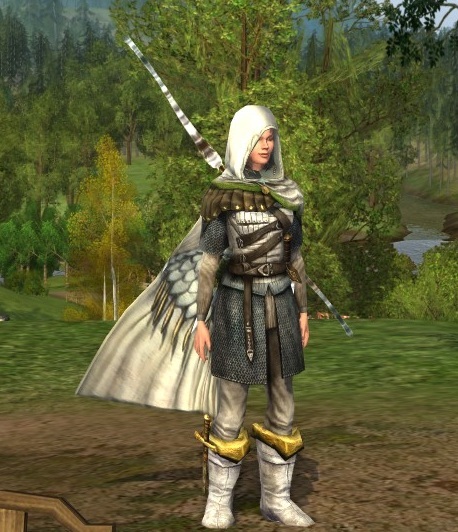 The Hooded Cloak of the Dove really made this outfit. She had her reasons, to wit: in the fight against a horrible, dark creature, she chose to wear blazing white as both a contrast and a beacon. “Bring it!” in clothing form, basically. But now that threat has ended, and she looks to other enemies. She feels no need to shout her presence any longer. So here’s how my mind works when I’m making a new outfit: who is it for, what is the in-character origin of the items, and what is the in-character purpose of the items? 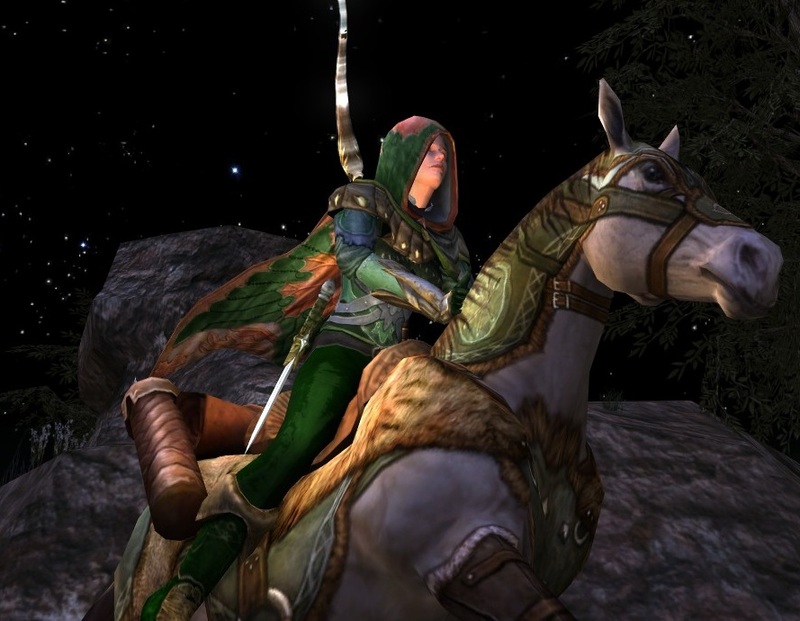 Sooo, Silevren is a long-lived huntress of great skill, private and reserved, with great dignity. 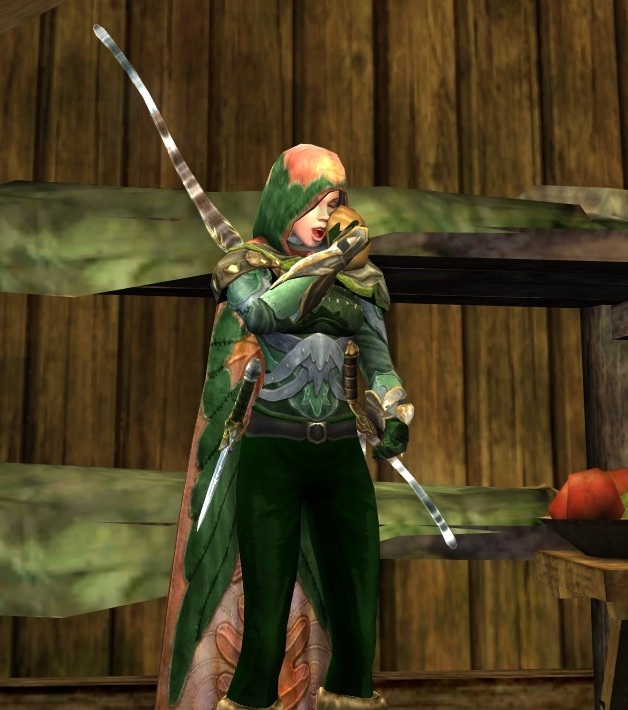 She’s been sheltering with Elves since her long hunt ended. She’s dressing to go fight again…somewhere. Probably dark and dangerous. 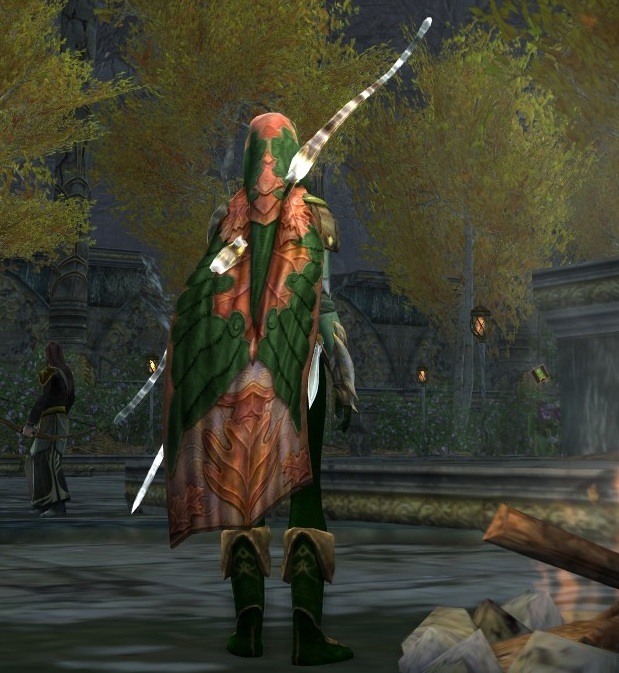 The Hooded Cloak of the Fallen Leaves is both elegant and practical: gorgeous camouflage. And the boots are Gaerdail, a rare drop I chose for its flavor text: “These Númenórean boots survived a long journey from Westernesse, only to be lost for many centuries.” I don’t care about that level of detail in my blog-only outfits, but in my everyday stuff? Absolutely. 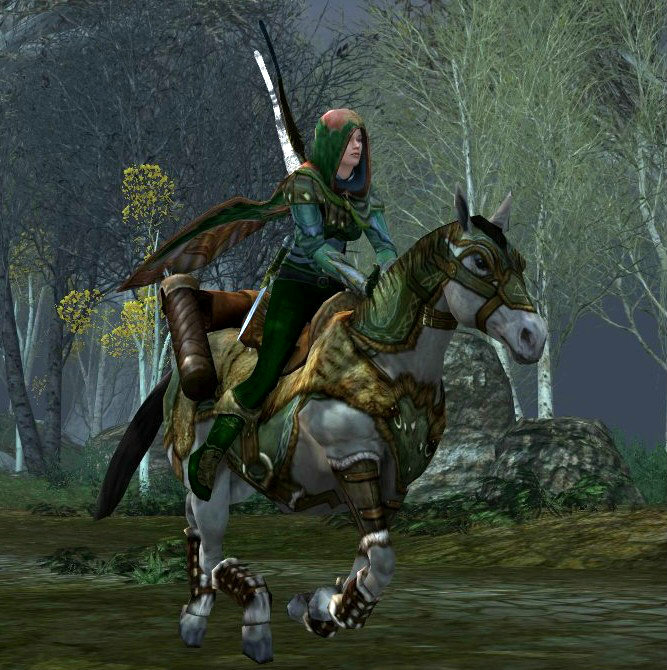 The Steed of the Hunter is always her ride. 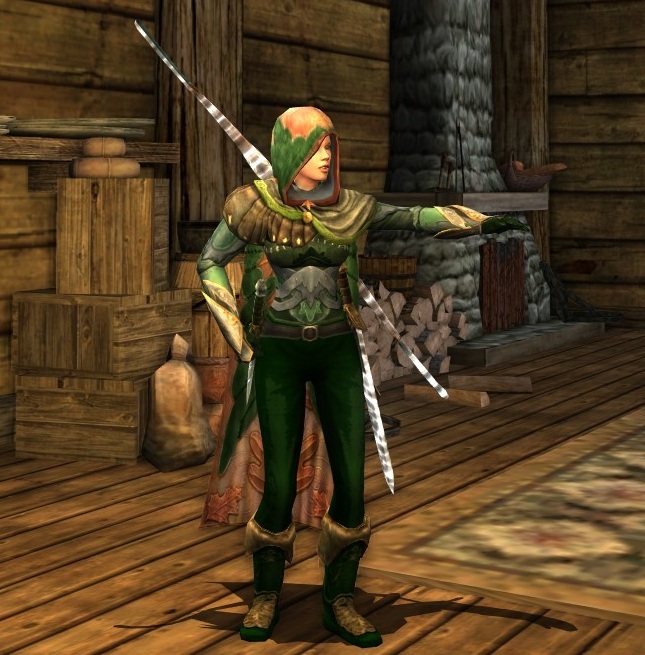 I wanted to mix Elven pieces with Man ones, so used the gorgeous Jacket of Celebrant (also seen in many other guises) and Sellsword’s Gloves right against the typical Rise of Isengard trouser model and the Worn Ranger’s Wrap. I try everything when I’m making an outfit. I stand at the vault and try just about everything. The dressing room feature is, of course, invaluable. I’m happy, too, that I’m a player who levels lots of toons, because cosmetic blogging (and cosmetic outfitting in general) can be really expensive. And since it’s my personal preference to solo, I grab what raid/instance cosmetics I can through skirmish marks. I haunt the Auction House a lot for bargains. When a dude standing next to Silevren in the Vault (ha, I really typed ‘dude,’ yes. Race of Dudes.) said ‘whoa nice armor’ when I equipped the completed outfit, that was a really cool feeling. Outfitting is artistic expression in a really limited pixel-medium. It’s a total hoot when someone likes what you’ve done.